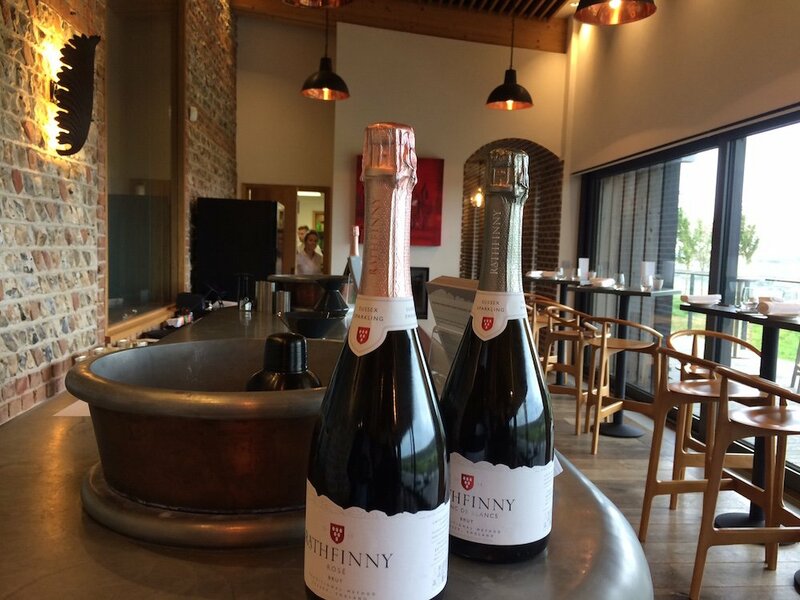 I love the lofty Rathfinny wine estate just above pretty Alfriston, having previously spent a night in the Flint Barns there (review here). So, I was excited when I heard that the vineyard’s Tasting Room was branching out from pop-up dining to regular lunches and dinners. The venue opened as a restaurant this summer and, with this year’s harvest just in, is heading into its its first autumn. 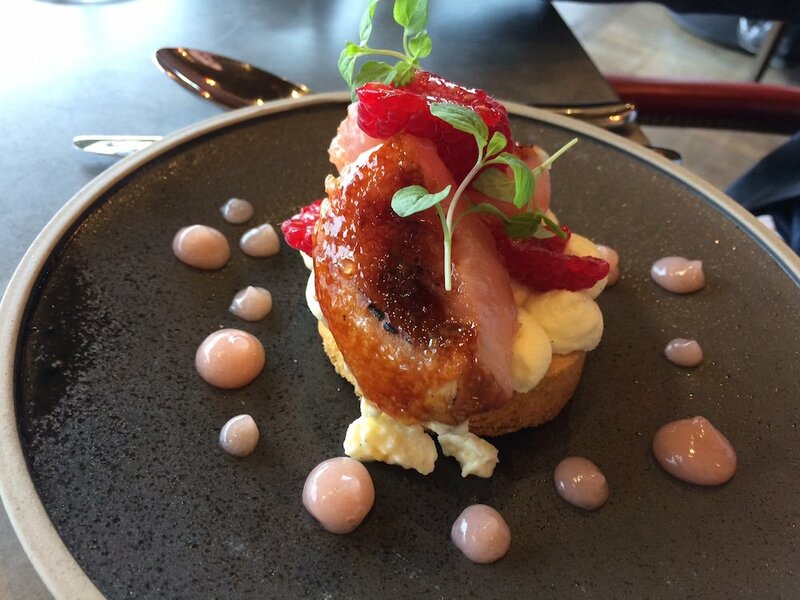 It specialises in seasonal modern British cuisine and is currently open for lunches and snacks on Wednesday, Thursday and Sunday lunchtimes and for lunch and dinner on Fridays and Saturdays. The menu is full of interesting twists and packed with texture and colour so that every dish was a visual treat before it even hit our tastebuds. There were several items we had to check – including the daikon, which turned out to be a root vegetable like a large radish/turnip, popular in Asia but grown locally in Lewes. 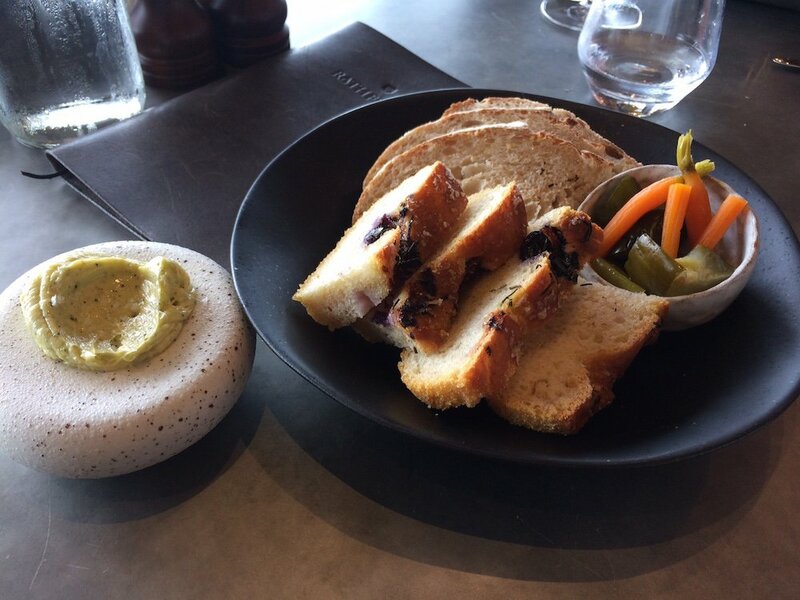 Even the bread was interesting, studded with grapes and accompanied by seaweed butter and pickled veg. 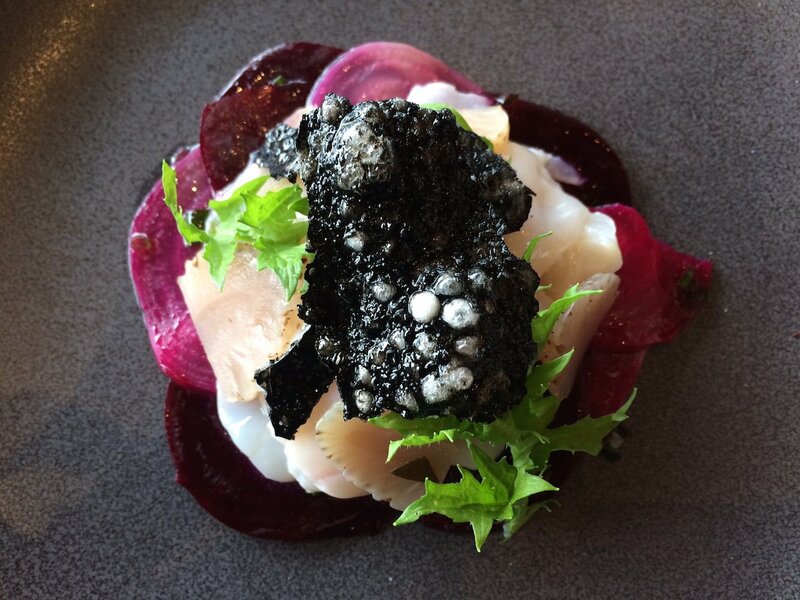 We both plumped to start with the delicate elderflower-cured Orkney scallop with pickled white strawberries, local beetroot and ink tuille – a great colour combo. 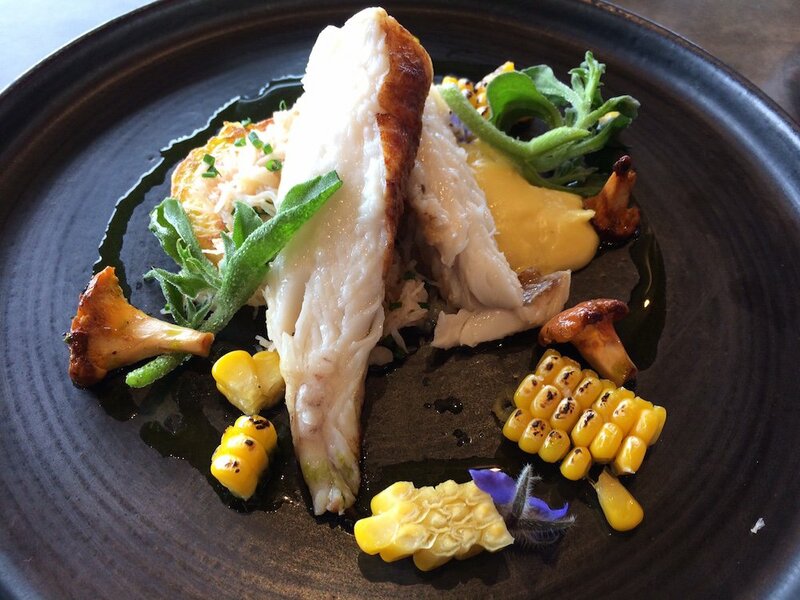 I then tucked into the monkfish tail, a favourite of mine I don’t see often enough on menus, which came with crab, charred corn, Scottish girolle, blini and tarragon – the tarragon not as seasoning but crunchy, like a vegetable, alongside edible flowers. It was a wonderful collection of flavours. 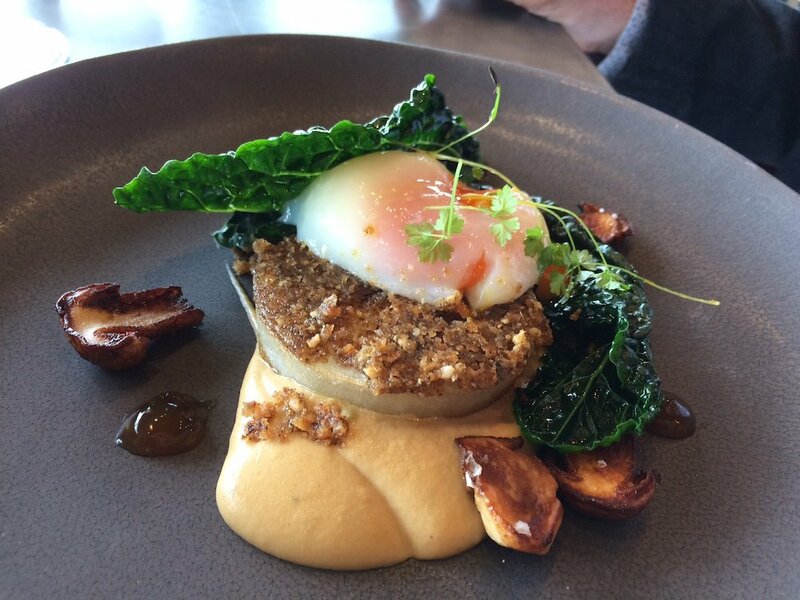 My husband went for that curious local baked daikon, an interesting texture, not flavoursome in itself but made more interesting with a hazelnut crust, cep puree, egg, kale and PX dressing. Meat lovers could have opted for partridge with Douglas fir and wild blackberry. Dessert continued to surprise with my other half choosing sable breton (French shortbread), glazed white peach, raspberry and whipped marscapone – a pretty and classy take on a peach Melba. 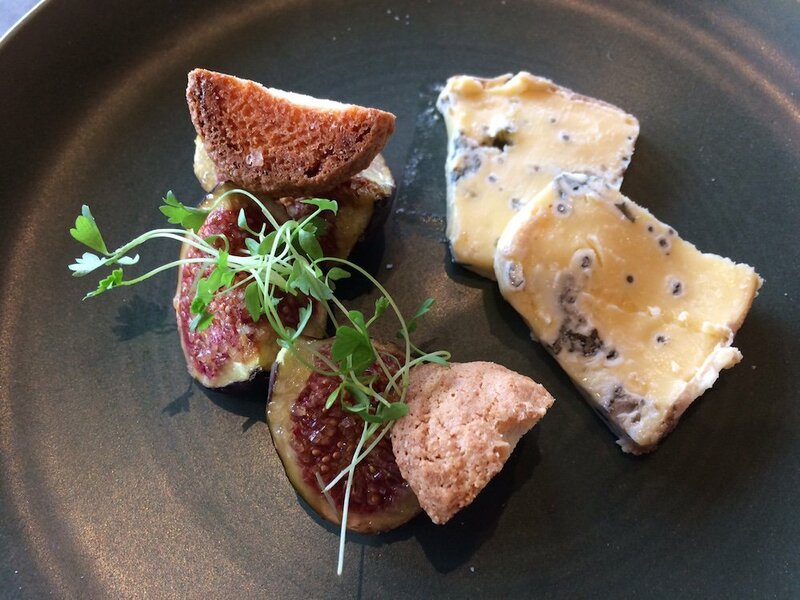 I had Fourme d’ambert – a French soft blue cheese, with baked black fig and amaretti biscuits and my, was it good. Within the week I’d made my own modest take on it for visitors. 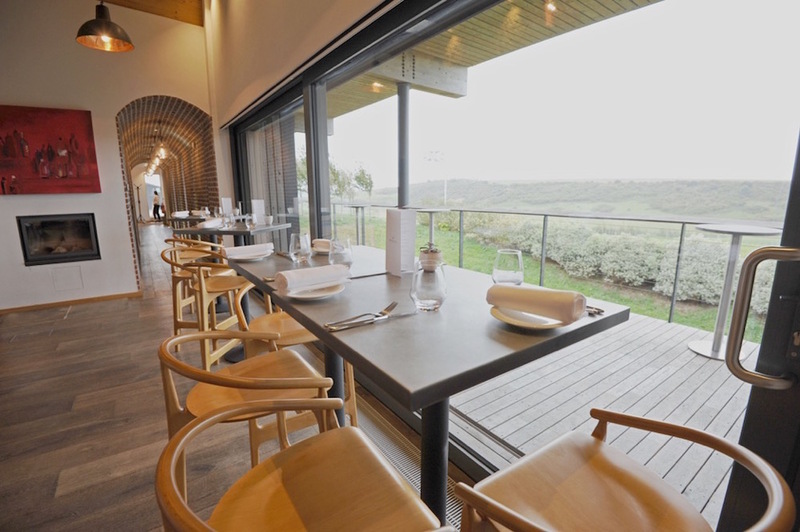 The view, over a valley of vines, is another real treat and adds an extra dimension to the dining. We spent our whole lunch watching a kestrel I nicknamed Kevin hovering and diving in search of his own meal. I was told he does that for hours every day with the area outside the restaurant his favourite hunting ground. There’s a circular walk of the estate you can do before or after, keeping an eye out for furry and feathered visitors. 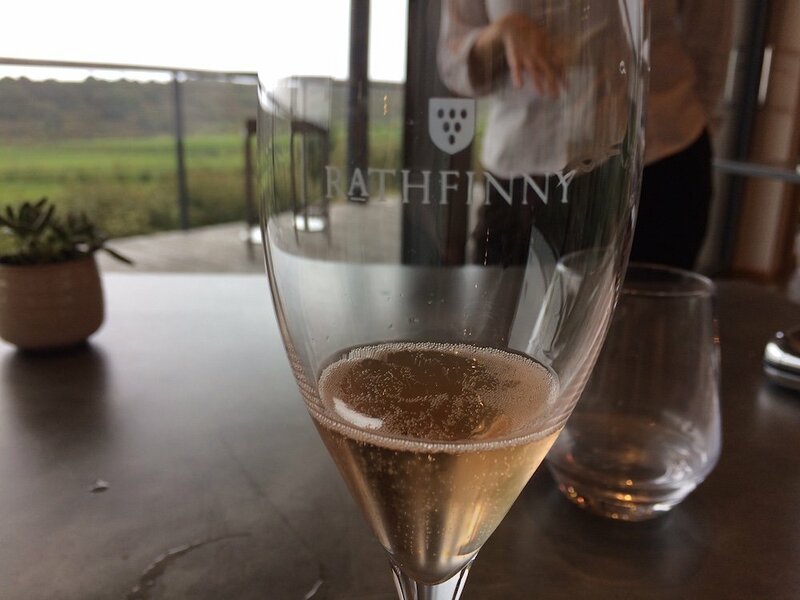 Naturally Rathfinny’s own wines are on the menu. The estate’s first sparkling, released this summer, has been something of a limited edition but there will be more available next year. You can also enjoy the Cradle Valley still white, blending Pinot Gris and Pinot Blanc, with your meal. There’s a deck over the vines just outside that’s a lovely spot to have a drink before dinner in decent weather. Though the Tasting Room is a fine dining restaurant it is unpretentious. 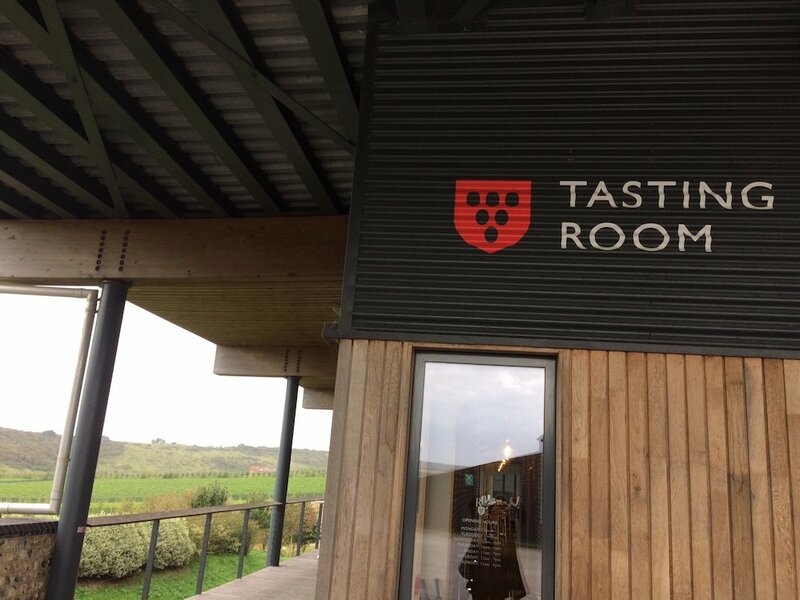 The staff were knowledgable and happy to chat about the food and its provenance, the wine process and the wildlife they’ve spotted around the vineyard. 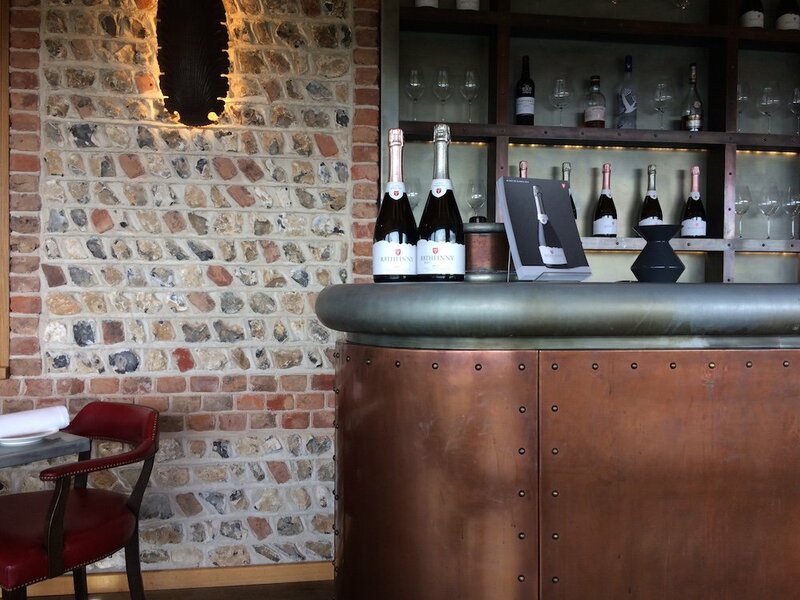 I felt it was a good cross-generational choice if you’re out with parents, for instance – smart and contemporary (I loved the copper bar) without being so hip it would alienate traditionalists. If you’ve a social gathering in the pipeline note it’s booking now for Christmas parties and can seat up to 10 together. I was there on a weekday lunchtime and it was pretty quiet, with relaxing piano music. In the evenings the restaurant is more buzzy and the deck has lanterns. After a certain hour, of course, you’d miss out on the view, so there are plans to spotlight the vines. It’s a beautiful location, with great food, do give it a try …and if you see Kevin, tell him Debbie says ‘hi’. Good for: Foodies and wine lovers. Wildlife fans. A treat or date with the view adding to the sense of occasion. A business lunch. A Christmas party. Those with mobility issues (you can park right outside, it’s on one level and there’s an accessible loo). Not so good for: If you’re seeking hearty comfort food or an extensive menu choice. Children – though they’re welcome in the daytime (over 12s for dinner), it would be a bit wasted on them. ££ Lunch is £30 for two courses, £35 for three. The set dinner menu is £55 (vegetarian) – £65 (meat or fish) for six courses. One thing that would be very useful when you are reviewing restaurants and other eateries is to let us know if dogs are welcome! We have no children but we do have a miniature wire-haired dacshund and we do not like to leave him alone at home for hours on end – particularly if it’s an ideal day for a walk before lunch, as it gives him the exercise he needs, too. I know that not everyone is a dog lover but for those of us who are, they’re members of the family and we like to spend as much time with them as possible. One thing we love about France is that children and dogs are welcome in most restaurants (sime pretty upmarket ones, too). OK uf you went for Michelin-starred dining maybe not, but in most cases well-behaved dogs are allowed Let’s hope for more of the same here. We love eating out! That’s a very good point Caroline I tend to note it with pubs but should ask with restaurants too where it’s less common. Hope the answer’s yes in this case! I do know that the Flint Barns at Rathfinny is dog friendly and as well as being a B&B they do pop-up roasts on certain Sundays. There’s great walking at the site.